Objective: To establish a method for detecting intracellular IL-2 in human peripheral blood γδΤ cells. Methods: Healthy Human Peripheral Blood Mononuclear Cells (PBMCs) were isolated, then stimulated with low molecular peptide antigen of Mycobacterium tuberculosis (Mtb-Ag), and a high proportion of γδΤ cells was obtained. PBMCs and γδΤ cells were excited with phorbol myristate acetate(PMA) and incomycin (IM). Protein transportion inhibitors (Brefeldin A, BFA) were used to block the secretion of cytokines and saponins taken for membrane permeabilization. Flow cytometry was applied to detect the expression of CD69 in CD3+ T cells to explore the appropriate time of membrane permeabilization. Then flow cytometry was implemented to detect the expression of intracellular IL-2 in γδΤ cells. Analysis of variance (ANOVA) and least significant difference(LSD) test were conducted to determine the statistical difference. Results: Compared with those with 5 min and 25 min of membrane permeabilization, CD3+ T cells with 15 min has the highest expression of CD69 (87.82 ± 2.28%) (F=112.805, P<0.001). Compared with γδΤ group, γδΤ+PMA+IM group and PBMC+PMA+IM+BFA group, γδΤ cells with the stimulant of PMA, IM and blocker of BFA (γδΤ+PMA+IM+BFA) had the highest expression of intracellular IL-2 (50.65 ± 6.25%) (F=321.071, P<0.001). Conclusion: Flow cytometry is an appropriate method for the detection of intracellular IL-2 in γδΤ cells, and it may be applicable to detect other cytokines in γδΤ cells. γδΤ cells is one of the subsets of T-lymphocyte with a small number which was found in the recent 30 years, only accounted for 0.5%~5% of the total number of lymphocytes in peripheral blood of adults . Recent studies [1-5] have found that the γδΤ cells in the body played an important role of anti-infection, anti-tumor, immune surveillance, immune regulation and maintenance of immune tolerance. In the past years, the γδΤ cells were separate by flow cytometry or magnetic cell separation technology, not only needing a lot of peripheral blood, but also requiring expensive equipment and complex operations. A large number of γδΤ cells were obtained in a short time through rapid amplification of peripheral blood lymphocytes by stimulated with Low molecular peptide antigen of Mycobacterium tuberculosis (Mtb-Ag) . To detect cytokines secreted γδΤ cell, the extracellular cytokines secreted by γδΤ cells were detected mostly through biological, immunological and molecular biological methods [7,8], which could reflect the basic situation of cytokine secretion by γδΤ cells, but it’s not precise enough. Intracellular IL-2 in single γδΤ cell was detected through flow cytometry and specific staining technology, CD69 molecular detection was controlled, satisfactory results were presented as follows. Main instrument: Instruments for the study included optical microscope (Olympus BH, Japan), inverted microscope (Wuguang, WJ12-50, XSB-14), CO2 incubator (Harris hw0301T-VBA, USA), flow cytometry (Coulter EPICSR XL-MCL, Beckman-counter Company, USA), cell culture plate (Falcon Company, USA). Main reagents: All the following reagents were obtained from commercial source, respectively. Mtb-Ag (kindly gifted by Dr. Henry Boom from School of Medicine, Case Western Reserve University, USA), lymphocytes separation medium (Chinese Academy of Medical Sciences Institute of Hematology), new born calf serum (Hangzhou Sijiqing Biological Company), cell culture medium RPMI 1640 (GIBCO, USA), PMA (Sigma, USA, SNP1585), IM (Sigma, USA, SNI0643), Brefeldin A (BFA, Sigma Company,USA,B7651); saponin, (Sigma Company, USA, S4521); PFA, (Sigma Company, USA, M122); anti-TCR γδPE (Becton Dickinson company, USA, SN3437907), rIL-2 (PTK company, USA),Anti-CD69FITC (Ancell company, USA, SN819010), anti-CD3PE (Ancell company, USA, SN9734008). Cells preparation: Peripheral venous blood collected from healthy adult was drawn into heparinized tubes, Peripheral Blood Mononuclear Cells (PBMC) were isolated from healthy human with conventional lymphocyte separation liquid, then adjusted the cell concentration to 1 × 106/ml and 2 × 106/ml with RPMI1640 complete culture medium for sparing. Gammadelta T cell preparation: PBMC suspension (1 × 106/ml) was seeded into 24-well culture plate with 1 ml/well, then Mtb-Ag (5 μg/ml) was seeded, cultured under the condition of 37°C and 5% CO2, IL-2 (50 μ/ml) was seeded every 3 d, high concentration of γδΤ cells were collected after 10 d, then adjusted the cells concentration to 2 × 106/ml with RPMI1640 complete culture medium for sparing. Determination of the experimental conditions for CD69 detection: Cell groups: group I: PBMC; group II: PBMC+PMA (20 ng/ml)+IM (1 μg/ml); group III: PBMC+PMA (20 ng/ml)+IM (1 μg/ml)+BFA (10 μg/ml). Cells (concentration of 2 × 106/ml) were seeded into 24-well plate with 1 ml/hole, cultured under the condition of 37°C and 5% CO2 for 4 h, then collected and washed with PBS-5% FCS-0.1% NaN3 cell suspension into 2 × 106/ml, then divided into two groups after cell staining: group I: detection of CD69 molecules on CD3+ T cell surface in PBMC. To detect the expression of CD69 on the cell surface of CD3+ T cells in three different treatment groups with CD3PE/CD69FITC staining by direct immunofluorescence staining technology; group II: intracellular CD69 molecular of CD3+ T cell in PBMC: to detect intracellular CD69 molecular of CD3+ T cell in three different groups. Cell staining was divided into cell surface staining, cells fixed, transmembrane and intracellular staining. In short, 100 μl cell suspension was added into each tube, then anti-CD3PE was added, light avoid 30 min under 4°C, washed the cells with PBS-5% FCS-0.1% NaN3, then centrifuge the cells for 5 min with the centrifugal radius of 10 cm and 3000 rpm, then the supernatant was abandoned; fixed cells with PBS-2% PFA 400 μl, light avoid 20 min under 4°C, then washed the cells with PBS-5% FCS-0.1% NaN3, centrifuged 5 min with centrifugal radius of 10 cm and 3000 rpm, then the supernatant was abandoned; rupture the membranes with PBS-0.1% saponin-10% FCS 400 μl; avoid light under 4°C in three different processing time: 5 min, 15 min and 25 min (to determine the best time for membrane rupture), centrifuge the cells for 5 min with the centrifugal radius of 10 cm and 3000 rpm, then the supernatant was abandoned; intracellular staining with anti-CD69FITC, light avoid for 30 min under 4°C, wash cells with PBS-0.1% saponin-10% FCS, centrifuged 5 min with centrifugal radius of 10 cm and 3000 rpm, then the supernatant was abandoned, then and washed cells with PBS-5% FCS-0.1% NaN3, centrifuged 5 min with centrifugal radius of 10 cm and 3000 rpm, then the supernatant was abandoned; finally, the cells were suspended in 400 μl PBS-0.5% PFA, light avoided and preserved under 4°C, detected flow cytometry technology within a week. 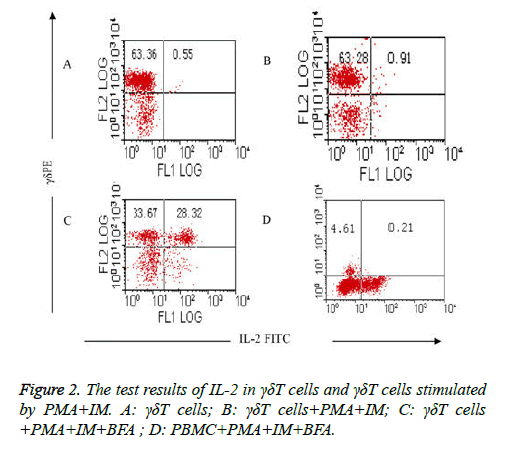 Detection of IL-2 in γδΤ cells: Cells were divided into 6 treatment groups: group I: γδΤ cells; group II: γδΤ cells (20 ng/ml+PMA)+IM (1 μg/ml); group III: the γδΤ cells (20 ng/ml+PMA)+IM (1 μg/ml)+BFA (10 μg/ml) the group of IV: PBMC+PMA (20 ng/ml) +IM (1 μg/ml)+BFA (10 μg/ml); the group of V: PBMC+Mtb-Ag (5 μg/ml)+BFA (10 μg/ml); group VI: the γδΤ cells+Mtb-Ag (5 μg/ml)+BFA (10 μg/ml). 2 × 106/ml cells were seeded in 24 well plates, 1ml/ hole, then cultured under the condition of 5% CO2 and 37°C, II-IV were cultured for 5 h, groups V and VI were cultured for 10 h, collect cells and wash cells with PBS-5% FCS-0.1% NaN3, then suspend the cell into 2 × 106/ml. Cell staining: intracellular IL-2 was detected by double staining with γδPE/IL-2FITC, staining steps are the same of above, finally detected by flow cytometry. Flow cytometry detection and analysis: In the flow cytometry, the argon ion laser wavelength of 488 nm was used as the excitation light, and the two-dimensional point diagram of FSC/SSC was used to detect the lymphocyte population. The data files were analysed with 2.8 version software. Statistical method Statistical analysis was performed using SPSS15.0 statistical software, the comparison of different membrane rupture time groups in the detection of intracellular factors and IL-2 in γδΤ cells were performed with single factor analysis of variance, the two-two comparison in different groups were performed with LSD test, there was statistically significant if P<0.05. The positive rate of CD3+ T cells and the expression of CD3+ in T cells under the conditions of cell treated with 5 min, 15 min, 25 min and 4°C with PBS-0.1% saponin were shown in Table 1. The results showed that the positive rate of CD69 in CD3+T cells under the condition of cells treated 15 min was the highest, it was up to 87.82 ± 2.28% (F=112.805, P<0.001), at the same time the effect of membrane rupture was better; but with the processing time increased to 25 min, the rupture of membranes is excessive, the morphology of the cells were destroyed, the proportion of CD3+ T cells in the total cells began to decline to 58.37 ± 1.89%, and the expression rate of CD69 in CD3+ T cells also decreased, so 15 min was the ideal time to membrane rupture. Compared with #, ##P=0.303>0.05, compared with # and ###P=0.001, compared with ## and ###P=0.003<0.05; compared with * and **P<0.001, compared with * and ***P<0.001, compared with ** and ***P=0.009<0.05. Table 1: Comparison of the positive rate of CD3+ T cells with different time of cell treatment and the expression of CD69 in CD3+ T cells; (n=5%, ͞x ± s). Expression of CD69 on CD3+T cell surface was fewer in freshly isolated PBMC (group I), only (0.66 ± 0.08%); but CD69 expression increased to (63.73 ± 7.25%) when activated after 4 h by PMA and IM (group II); the expression of CD69 on CD3+T cell surface decreased sharply to only 4.56 ± 4.06% when inhibitor BFA was added at the same time of cell activation (group III) (Table 2 and Figures 1A1-1C1). The results showed that the stimulator (PMA, IM) and blocking agent (BFA) were both effective. Expression of CD69 in CD3+T cells was very fewer (only (0.50 ± 0.06%) when the cells were not activated; the expression was (2.79 ± 0.31%) when cells were activated without BFA (group II), but the expression increased to (57.12 ± 0.62%) after joining BFA (group III) (Table 2 and Figures 1A2-C2). Compared with PBMC: ap<0.05, bp>0.05, ep<0.05, fp<0.05; compared with PBMC+PMA+IM: cp<0.05, gp<0.05. Table 2: Comparison of CD69 expression on the surface of CD3+T cells and intracellular CD3+T cells in PBMC n=5%, (͞x ± s). 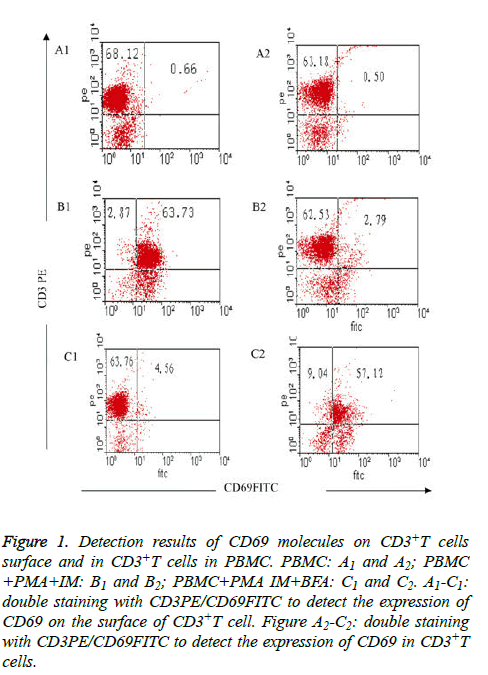 Figure 1: Detection results of CD69 molecules on CD3+T cells surface and in CD3+T cells in PBMC. PBMC: A1 and A2; PBMC +PMA+IM: B1 and B2; PBMC+PMA IM+BFA: C1 and C2. A1-C1: double staining with CD3PE/CD69FITC to detect the expression of CD69 on the surface of CD3+T cell. Figure A2-C2: double staining with CD3PE/CD69FITC to detect the expression of CD69 in CD3+T cells. Comparison of the test results of IL-2 in γδΤ cells and γδΤ cells stimulated by PMA+IM: The results showed that intracellular expression of IL-2 in γδΤ cells was very fewer in group (Table 3) which isn’t stimulated with PMA and IM (group I) and group which is stimulated with PMA and IM but without the existence of BFA (group II), it was respectively (0.55 ± 0.07%) and (0.91 ± 0.12%), as shown in Figures 2A and 2B. High expression (50.65 ± 6.25%) of IL-2 in γδΤ cells were detected when γδΤ cells are stimulated by PMA, IM and inhabited by BFA (group III) (Figure 2C). stimulation and activation results of PMA+IM on PBMC (group IV): intracellular IL-2 in γδΤ cells were rarely detected, only (0.21 ± 0.03%) (Figure 2D). Compared with γδΤ cells, ap>0.05, bp<0.05, ep>0.05; compared with γδΤ cells+PMA+IM, cp<0.05, fp>0.05; compared with γδΤ cells+PMA+IM+BFA, gp<0.05. Table 3: Comparison of the test results of IL-2 in γδΤ cells and γδΤ cells stimulated by PMA+IM n=5%, ͞x ± s). Figure 2: The test results of IL-2 in γδΤ cells and γδΤ cells stimulated by PMA+IM. A: γδΤ cells; B: γδΤ cells+PMA+IM; C: γδΤ cells +PMA+IM+BFA ; D: PBMC+PMA+IM+BFA. 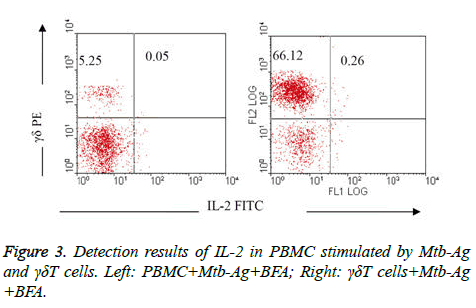 Comparison of IL-2 detection results in PBMC stimulated by Mtb-Ag and γδΤ cells: IL-2 were rarely detected in PBMC activated by Mtb-Ag (group V) and γδΤ cells in 10 h (group VI), it was only 0.05% and 0.26%respectively (Figure 3). Figure 3: Detection results of IL-2 in PBMC stimulated by Mtb-Ag and γδΤ cells. Left: PBMC+Mtb-Ag+BFA; Right: γδΤ cells+Mtb-Ag +BFA. The basic principle to detect intracellular cytokines with Flow cytometry is to prevent the secretion of cytokines by using protein transportation inhibitors (such as BFA), then cytokine retained within the cell and was detected through cell fixation, rupture of membranes, drilling and other processing with the cell surface antigen monoclonal antibody and anti-cytokine monoclonal antibody labeled by immunofluorescence. There are four key steps in the method: the stimulation of cell activation, immobilization, the rupture of membrane and the inhibition of protein secretion. Cytokines were produced only after the activation of cells, good cells fixation can keep the cellular morphology and withstand rupture, rupture of membranes not only could not damage cells morphology too much, but also should combined the cell factor monoclonal antibody labeled with immunofluorescence with cytokines. Otherwise, to inhibit the secretion of proteins is a prerequisite, therefore, there are many important aspects related to the success or failure of the experiment: time of stimulation and cell culture, determination of fixed agent, concentration of penetrating agent, temperature and action time, as well as the blocking agent concentration and action time, but the condition of membrane rupture was the most critical. Using CD69 as experimental comparison, mainly based on the following considerations: 1. Stimulated the cells to be activated without protein transport inhibitors, the expression of CD69 molecules on cell surface were detected (maybe high expression) to confirm whether cell activation was stimulated effectively by stimulator; 2. Protein transportation inhibitor was added at the time of stimulation of cells activation to determine whether the inhibitor was effective by detecting the expression of CD69 molecule on cell surface (the expression should be low); 3. Detection of intracellular CD69 can be inferred whether the rupture of membrane and cell drilling was effective. If this method failed, problems can be quickly found out and easily to be solved with the detection of CD69 as control. The better detection of CD69 can ensure the correctness of the experimental method. The experimental results show that is better for membrane rupture under the conditions of 4°C, 15 min with PBS-0.1% saponin. There are two reasons to choose 4°C: the first one, it is easy to be controlled at a temperature of 4°C and can be placed in the refrigerator directly; the second, the fluidity of the cell membrane is reduced under the condition of 4°C, and the cell membrane is easily to be perforated. It’s different between freshly isolated γδΤ cells and cultured γδΤ cells stimulated by PMA+IM on the intracellular IL-2 detection, the results is that freshly isolated γδΤ cells produced very lower IL-2 but cultured γδΤ cells produced higher, the reason may be the signal transduction of two different cells are different, or properties of cultured γδΤ cells tend to γδΤ CD4+T cells, and can produce more IL-2. There is no obvious difference between freshly isolated γδΤ cells and cultured γδΤ cells through the analysis in the experiment of CD69 detection, so we speculate that there are different signal transduction pathways of CD69 and IL-2. Freshly isolated γδΤ cells and cultured γδΤ cells stimulated by Mtb-Ag produced rare IL-2, this may be due to weaker stimulation of Mtb-Ag to cell activation, during the experiments of γδΤ cells proliferation in PBMC stimulated by Mtb-Ag, γδΤ cells proliferation was slow in the early 3D, but γδΤ cells began to proliferate quickly when 3D is added to culture with IL-2. In a sense, Mtb-Ag is not a strong irritant like PMA/IM. In our study, the activation peak time of γδΤ cells in PBMC stimulated by PMA+IM (6 h) was 18 h faster than that of stimulated by Mtb-Ag (24 h), then decreased slowly after reaching the peak, as well as the expression rate of CD69 was much higher than that of stimulated by Mtb-Ag , this is related to signal transduction pathway initiated by T cells phosphatidylinositol from the downstream directly and passing by the pathway of TCR activation about PMA+IM. But Mtb-A initiate the signal transduction from the complex body of TCR-CD3, so the speed of cell activation is slower, as well as the intensity of cell activation after stimulation is not enough. In the experiment, the expression rate of IL-2 in γδΤ cells was 50.65% when γδΤ cells stimulated by PMA+IM and inhibited by BFA at the same time, the better result provided a methodology foundation to detect other molecules in γδΤ cells, also constructed a foundation to further detect the function or activation of IL-2 during the signal transduction process of γδΤ cell activation. The research was supported by the National Natural Science Foundation of China (No.81473687), Shandong Provincial Natural Science Foundation of China (No.ZR2009CM039 and No.ZR2013HM038),Shandong Provincial Medical and Health Science and Technology Development Plan (No.2015WS0095), Science and Technology of Shandong Province Health Science and Technology Association (No.2016BJ0012)and Tai’an Science and Technology Plan (No.201440774). Wang KQ, Hou YQ, Li QH, Zhao DP, Duan YC, Ran ZS, Li XQ. Inhibitory effect of LY294002 on CD3mAb-activated T cells and Mtb-Ag-activated γδΤ cells via TCR signal transduction pathway. Int J Clin Exp Pathol 2017; 10: 5538-5544. Ramutton T, Buccheri S, Dieli F, Todaro M, Stassi G, Meraviglia S. γδT cells as a potential tool in colon cancer immunotherapy. Immunotherapy 2014; 6: 989-999. Murphy AG, Okeeffe KM, Lalor SJ, Maher BM, Mills KH, McLoughlin RM. Staphylococcus aureus infection of mice expands a population of memory γδT cells that are protective against subsequent infection. J Immunol 2014; 192: 3697-3708. Schwartz E, Rosenthal E, Bank I. Gamma delta T cells in non-immune patients during primary schistosomal infection. Immun Inflamm Dis 2014; 2: 56-61. Wang KQ, Hou YQ, Gu CX, Zhao DP, Duan YC, Ran ZS, Li QH, Li XQ. Inhibitory effect of the mitogen activated protein kinase specific inhibitor PD98059 on Mtb-Ag-activated γδΤ cells. Int J Clin Exp Pathol 2017; 10: 9644-9648. Wang KQ, Hou YQ, Li Y. A simple and rapid method for propagation and purification of the peripheral blood γδΤ cells. Zhongguo Shi Yan Xue Ye Xue Za Zhi 2004; 12: 372-374. Caraher EM, Parenteau M, Gruber H. Flow cytometric analysis of intracellular IFN-γ.IL-4 and IL-10 in CD3+4+ T cells from rat spleen. J Immunol Meth 2000; 244: 29-40. Tayebi H, Lienard A, Billot M. Detection of intracellular cytokines in citrated whole blood or marrow samples by flow cytometry. J Immunol Meth 1999; 229: 121-130.